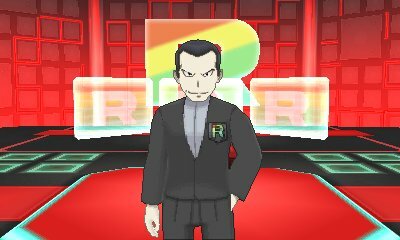 Team Rainbow Rocket are a revival of the original Team Rocket and, like Team Rocket, are led by Giovanni. After becoming the champion of Alola, the special Team Rainbow Rocket episode begins! The first note about Team Rainbow Rocket happens after you have cleared Poni Grove of Blacephalon & Stakataka. 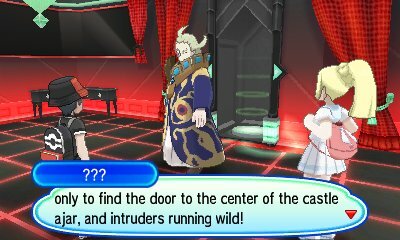 Sophocles will burst into your house and mention about how Festival Plaza has been hacked. Going into it with him, you will see it has been taken over by Team Rainbow Rocket and you can't use any functions of the Festival Plaza, including your own Pokémon. However, there is a solution. 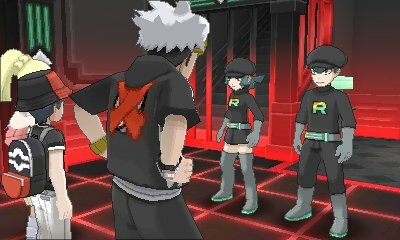 You can use Pokémon from the Battle Agency in order to take on Team Rainbow Rocket. Defeat the Grunt and Sophocles will manage to get control back to Festival Plaza. Shortly afterward, your mother will show a trick of her having taught Meowth how to turn on the TV. It will cut to a press conference where Lusamine and Wicke are explaining what happened during the Poni Island incident when Necrozma appeared. However, the press conference gets interrupted by an Ultra Wormhole opening and a Rocket Grunt running towards Lusamine, with Giovanni not far behind. Lillie will run into your house shocked by this and say she is heading to the Aether Paradise to go check if her mother is alright. Follow her and you'll get there to see that the building has changed to a castle. 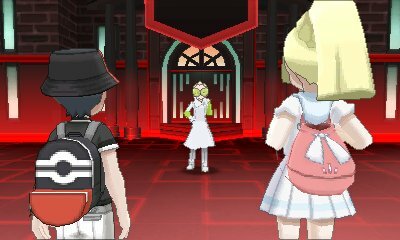 As you go to go inside, Faba will stop you and say there's no stopping Giovanni's plans as they can save even more Pokémon. He will challenge you and Lillie to a Multi Battle. 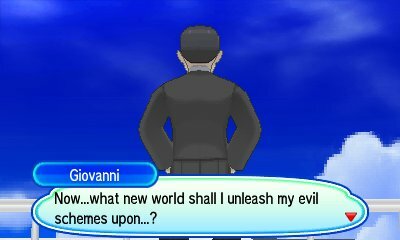 Defeat Faba and he will mention that Giovanni brought the strongest minds from different universes to achieve his goals but will let you in. When you go inside, you'll see that everything has changed, but you can't access the portal to the preservation room to find Lusamine. 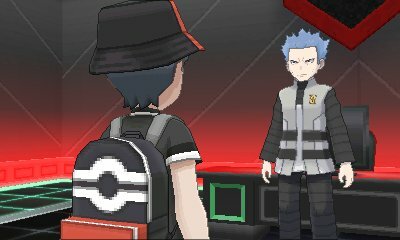 As you go to leave, some Grunts stop you, but Guzma comes in wanting to help stop Team Rocket. He teams up to battle against the Grunts. After the battle, he will get them to open up the doors to the left and the right so you must explore the areas in order to hunt for Lusamine. Lillie will remain behind in Lusamine's room to heal your Pokémon should they need it. On the Left hand side, you will encounter numerous warp puzzles to various rooms with Team Rocket Grunts and various items. These puzzles require you to move between multiple rooms to get the path to the end. When you reach the end, you'll find the room for Archie, the leader of Team Aqua. Archie has been brought from a world where he was successful in causing Hoenn to flood in order to create a world where Pokémon can live free and multiply, but he was pulled away right when he was successful. Now on this planet, it is his goal to duplicate his successes. Defeat him and press a button behind the painting in order to continue onwards. On the right hand side, you will encounter a puzzle where you hyave to press a switch for panels to light up, you then need to step on them in that order. However, various Team Rocket Grunts will interrupt you part way through to lose your place.. 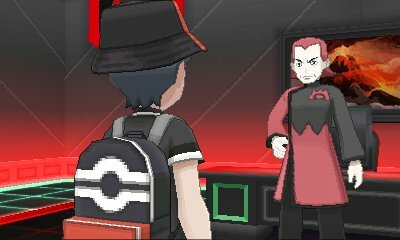 When you reach the end, you'll find the room for Maxie, the leader of Team Magma. Maxite has been brought from a world where he was successful in causing Hoenn to dry up to create a world where people and Pokémon can have more land so they can live without having to cause conflict with eachother, but he was pulled away right when he was successful. Now on this planet, it is his goal to duplicate his successes. With Team Aqua and Magma subdued, the gates upstairs are now open. 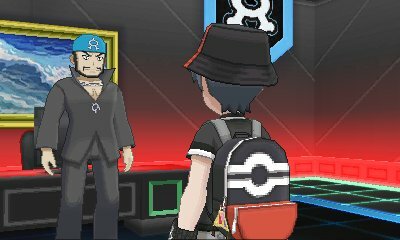 Guzma forces the grunts to explain how to access the warp tiles in Lusamine's Room and they explain that you need a special card key. However, before you get in there, both Archie and Maxie appear. Spotting each other, they both start fighting, as they defeated each other in their own worlds. As they get ready to settle things, they mysteriously disappear. Taking the left stairs, you then go onwards through a new puzzle. These rooms feature moving tiles which push you in the direction they're pointing, requiring you to navigate around them. At the end, you will find the Team Galactic Boss, Cyrus. Cyrus will immediately ask you if this world is new, however by your responses he realises that this is not the world he wishes to create, though it has some interesting features such as the Rotom Pokédex. He decides he needs to bring his new world back so challenges you. His team varies depending on if you have Ultra Sun or Ultra Moon. Defeat him and he'll promise to go back to his world, without harming this one. He'll give you the Galactic Key which can be used in the panel behind him to open the mirror door. Take the right stairs and you'll face puzzles where you have to rotate statues of Meowth in order to make a path for yourself. If you hit line of sight of a Meowth statue, then you will get sent back to the room's entrance and have to begin again. At the end is Lysandre of Team Flare. He will mention that he had just unleashed the Ultimate Weapon to end all foolish life, leaving only Team Flare alive, but got zapped to this world instead. He will give you a choice to proceed. Pick between either button. One activates the portal, the other activates the Ultimate Weapon. Which ever you pick, it will be the one for the Ultimate Weapon and you have limited time to stop it by pressing the other button. 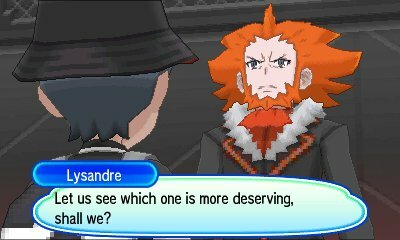 Lysandre decides that you need to beat him first before you can continue on. 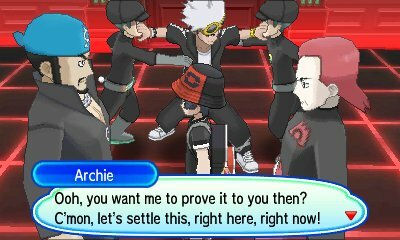 His team differs between Ultra Sun & Ultra Moon. Defeat him and he'll mention that if his world had someone like you, he probably wouldn't have succeeded in his goal. The portal is now open..
Return to Lusamine's room and prepare to go into the portal. When you do so, Ghetsis will appear and mention about hearing the intruders. He will say nothing can stop Giovanni's plan, but eventually lets slip that his plan is to use Giovanni as a pawn, a pretend king, so that he can go to other worlds to liberate Pokémon from their trainers so he can rule across many worlds. He will then challenge you. His team differs between the two versions. Defeat him and he'll say that his plans can't be stopped, and threatens Lillie's life if you don't stand down and give him your Poké Balls. Before you can act, Colress appears. Colress says Ghetsis hasn't changed, even if this is a different Ghetsis to the one that he knows. He says he has been sent by Wicke to help out. Colress has developed a machine that can send things back to their own worlds and sends Ghetsis back. He notes how Necrozma's power overflowed and allowed for this to happen. When you enter the preservation room, you will find Lusamine unconscious and not responding. Giovanni has knocked her out and is using the power to control her to his will. He says that his plan is to create an army of Ultra Beasts to conquer all worlds. He offers you a chance to join him, but denies your answer. He challenges you to a battle, saying that it makes him feel oddly nostalgic. His team differs between versions. Once defeated, he will note that he was foolish to fight a kid with all of his might, but he'll leave the Aether Paradise. Noting that Team Rainbow Rocket will never fail, he steps aside hoping to meet again. 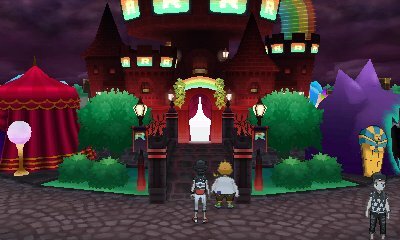 Colress and Guzma rush to the area, with Colress reverting the Castle back to the Aether Paradise. Colress then takes his leave to continue his research. Faba tries to act like he was helping out, for Lillie to inform Lusamine otherwise. This causes him to run off and pledge to do better. He is shown to have become an intern at the Aether Paradise. Lillie and Wicke then thank you for helping out, with Wicke giving you 55 Big Nuggets that were found. Everything now returns to normal, but Giovanni is still here and questions what world he should go after next, before finally disappearing. All items not picked up in the Rocket Castle can be obtained by speaking to the Janitor outside the building.